Your trees and shrubs may stop growing in the winter, but they still need protection to survive until the subsequent spring. The onset of the winter means it’s time for your trees and shrubs to take a nice long rest in preparation for the subsequent spring time. However, that doesn’t mean that they don’t require some care during the dormant period. The dangers for your trees and shrubs are just as present during the winter as it is during any other time of the year. While snow and ice are the obvious dangers, others that are lesser-known include animals such as rabbits, deer, and rodents who see your trees and shrubs as a free feeding ground when food sources are scarce. Want to protect your trees and shrubs from the perils of winter? Here are some tips you can follow. Mature trees and shrubs in the area usually don’t need any additional protection as they are hardy and have adapted to the climate change. But young and newly planted ones need protection to help them survive the winter cold. Make sure they are staying well-watered right up until the ground freezes. Once the ground has frozen, apply a 3-4 inch layer of insulating mulch around the bases of the trees, shrubs, and plants, leaving a little bit of breathing room for the trunks. This will help to insulate the soil and prevent heaving. 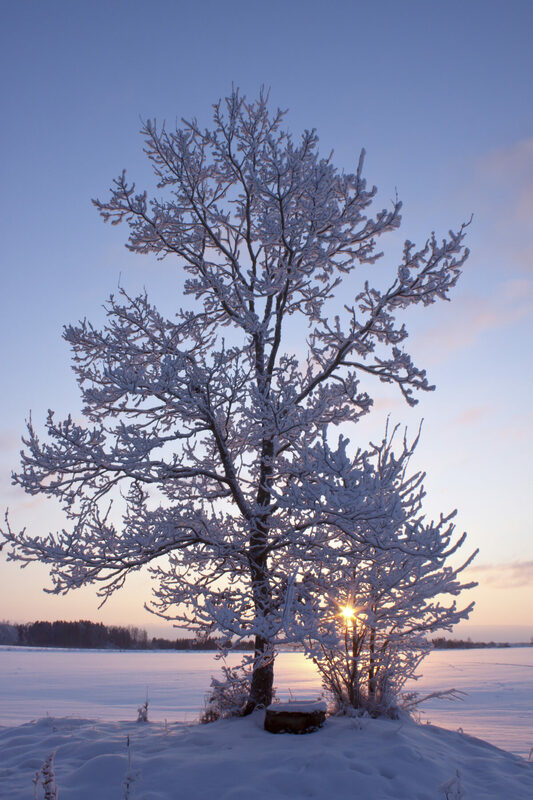 Use paper tree wraps to protect the trees from frost cracks and sunscald. And use tree guards to protect them from mice and rabbits gnawing on the bark. Despite the name, evergreen trees can sometimes suffer browning as a result of winter’s harsh conditions. And plants with later season growth are especially vulnerable. A great way to protect them this winter is using burlap. Surround the young plant by placing a few wood stakes around it, leaving a few inches of space between the stakes and plant. Lay the burlap over the stakes and secure them with staples. Don’t let the burlap touch the plants – if it gets wet and ends up freezing, it can cause damage to your plant. Remove the burlap when the weather starts to warm up, but leave the stakes in case you need to cover the plant again for another cold snap! And if all of this seems difficult, give your local landscaping company a call to help with the protection of your trees and shrubs! This entry was posted on Wednesday, December 21st, 2016	at 8:58 pm	and is filed under Blog, Tree Care	. You can follow any responses to this entry through the RSS 2.0	feed. Both comments and pings are currently closed.